We bought this tall unwieldy mallow at the Brooklyn Botanic Garden plant sale. It was covered in over the top pink flowers and had that wild English garden look we love. We hauled it back to our roof garden, not knowing what to expect. It has been blooming every couple of weeks all summer, disguising an ugly chimney. 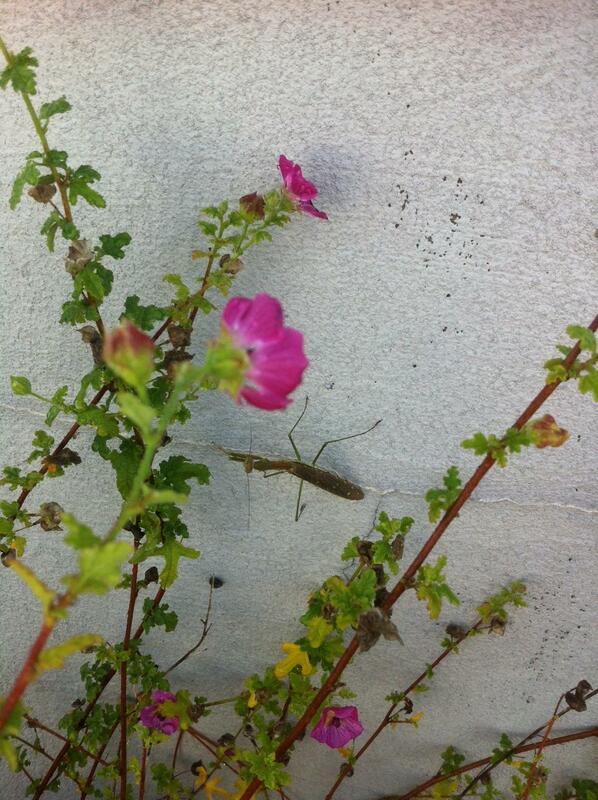 I just found out it has also become the home of this preying mantis! We’ve had many more critters this summer. I didn’t like the ants crawling down into then kitchen in the spring, and we don’t like the crunchy huge black flying bugs that come out with the sun comes down and the wine comes out, but we’ve mostly had bees and butterflies, even bats and dragon flies. Tree pits are all about shade lovers. 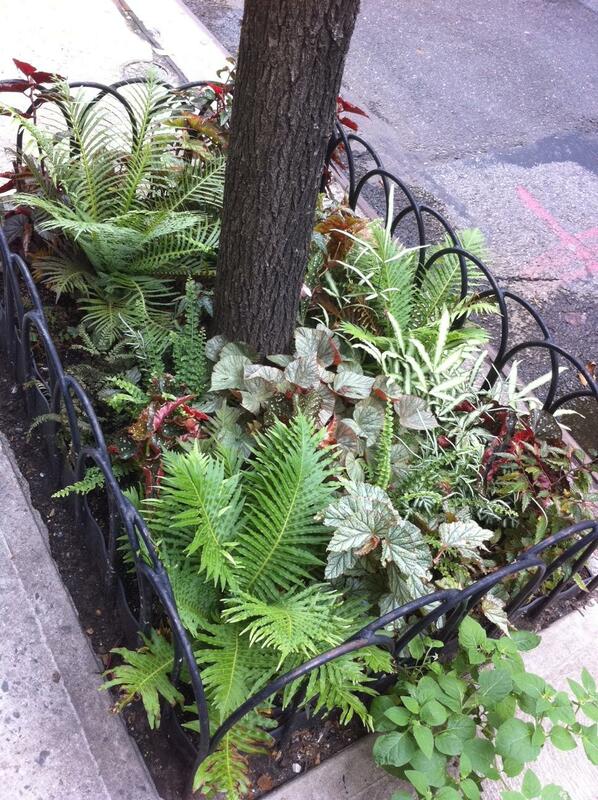 How smart to rely on foliage for texture and color. 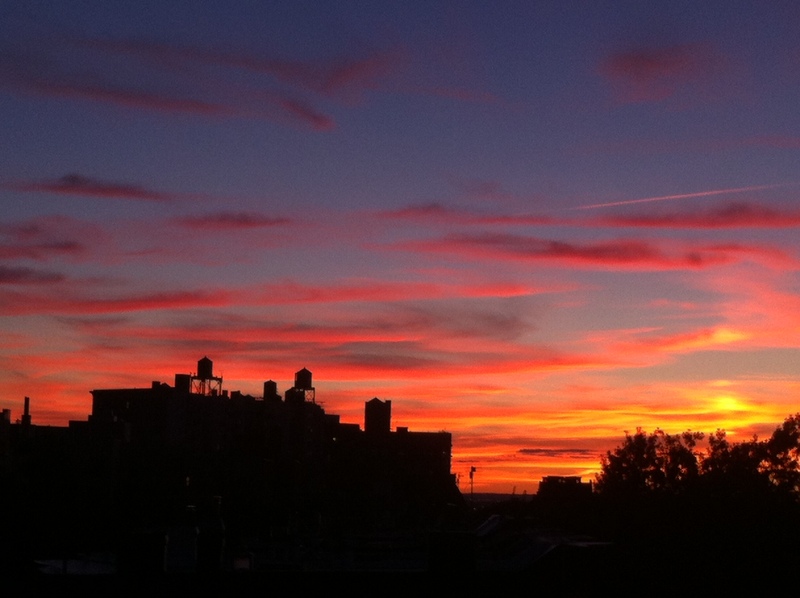 I snapped this last summer in the West Village and just found the image on my phone today. 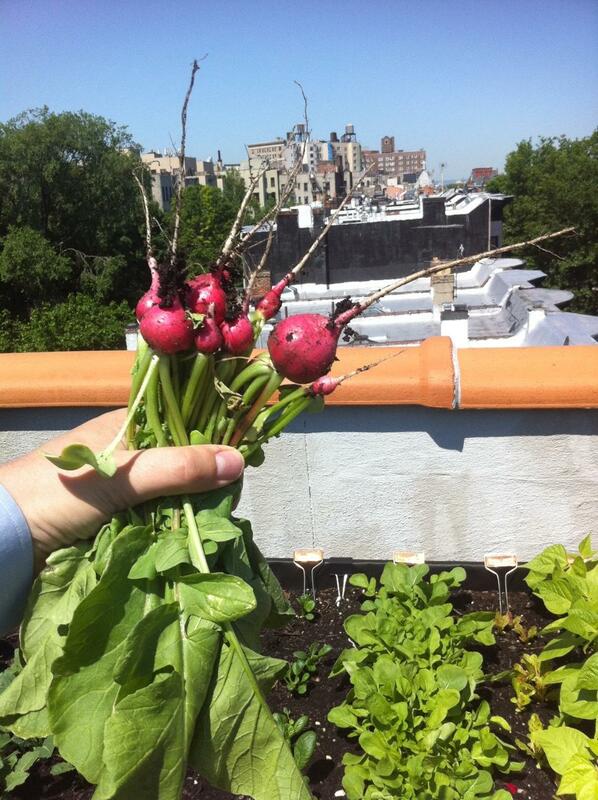 When we took a rooftop gardening class at the Brooklyn Botanic Garden this spring, the teacher warned that growing small amounts of vegetables on a roof top was unsustainable and probably silly. Too much water, too much time. She was totally right. I could have bought this bunch of radishes this morning at the farmer’s market for $1.99. Plenty of trendy succulents could creep along in the sun where my Veg Trug is. And yet, growing my small vegetable garden from seed has given me complete child-like glee. Faith and hope are hard to think about, but dropping a row of seeds in the ground in March and pulling out a bunch of radishes today is my good thing. Yes, I suppose I am the stereotypical yuppie gardener (don’t get me started about how much better MY rooftop arugula tastes!) but I hope I’m a little bit of a kid bringing home a gangly sprout rooting in a milk carton too. 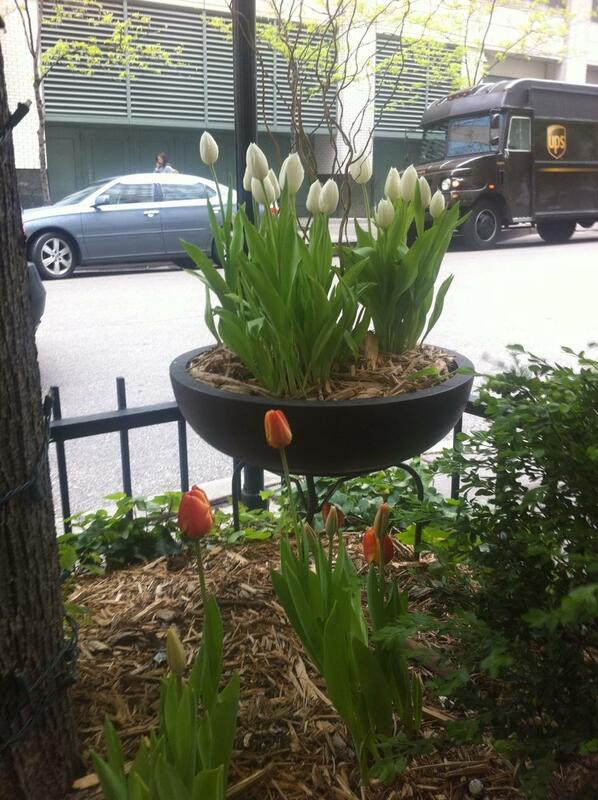 Check out these tulips standing on their tiptoes in front of The James hotel in Chicago. A bowl of white tulips with curly willow sits in a stand, expanding the growing space and adding height. The tulips are just outside your window when your cab pulls up to this hip hotel. This could be a bit floristy feeling for our Brooklyn residential block, but it is fresh and eye-catching just off the Magnificent Mile. 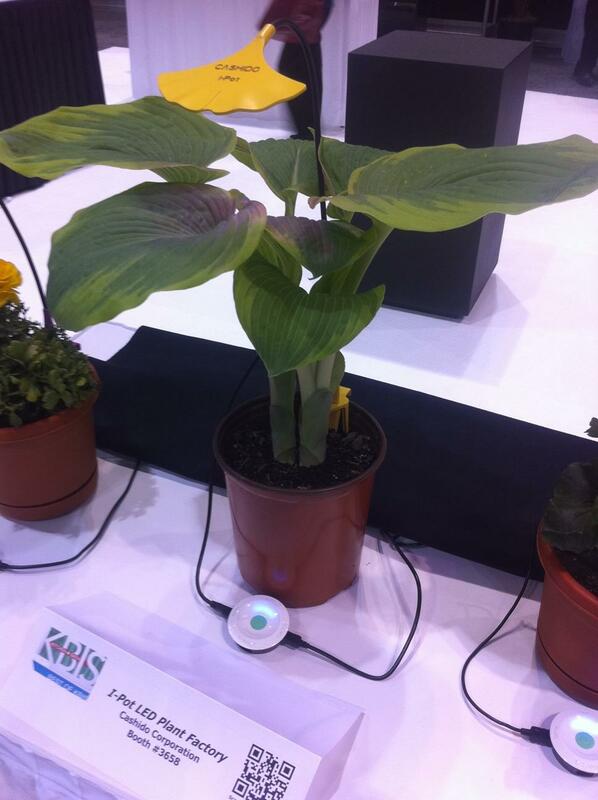 I’m in Chicago for work and found this iPot. I’ve been looking for a small tasteful grow light to start a few seeds and small plants inside. This might be a solution. I noticed black spots all over the leaves of our hibiscus. Tiny black bugs – I think they are aphids – are crawling all over. There seem to be ants racing up and down the branches “farming” the aphids. Confession: I don’t really like hibiscus and wouldn’t be overly sad if it went. They seem to tropical for Brooklyn and the flowers remind me of the Ocean Pacific tee shirts I wore in junior high. This tree was left by the precious owners of our apartment. 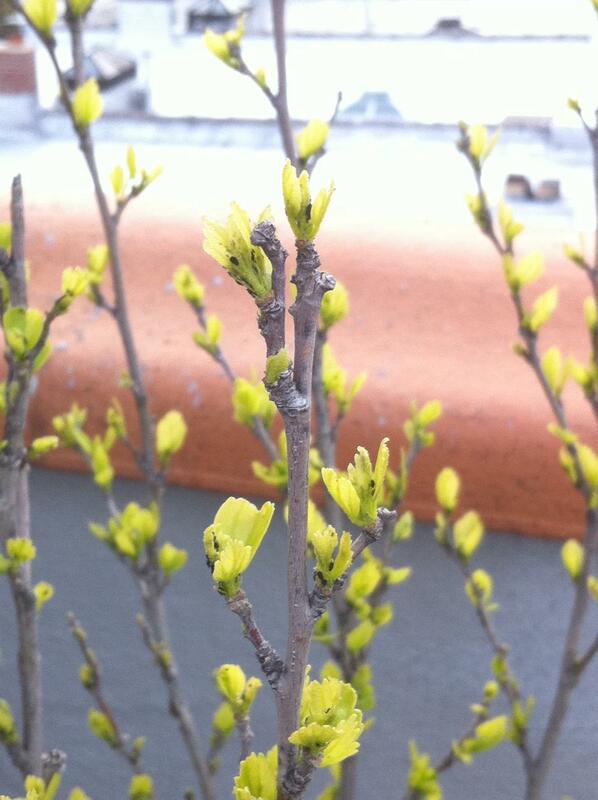 This tree does have one cool trick: it blooms twice each season. It flowered to welcome us in September, just as we moved in. We’ve never had a problem with roof garden pests before and I don’t want these aphids to spread to other plants. Luckily RP and I are taking a class at Brooklyn Botanic Garden tomorrow. I bet we’ll find some advice there.